All our Fuel Tanks are produced in 2mm Alloy Our Tanks are handmade but every tank made of the same type will be identical. 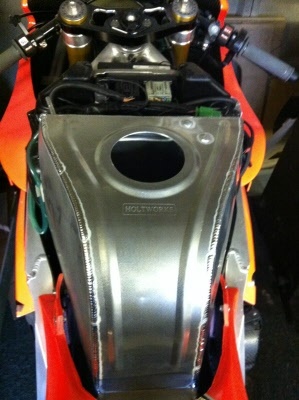 Our tanks are TIG Welded, and will be stamped HOLTWORKS on the bottom with a trace number. ***The fuel outlets on all tanks will be 1/4" BSP Unless stated otherwise, please let us know if you require a different thread *** If Tank alterations are made to fit your frame this will incur a small additional charge - please call to enquire. PLEASE REMEMBER TO ORDER SPIGOTS, NUTS & HOSE FROM OUR ACCESSORIES SECTION!